Platform is an episodic browser-based platform game that is updated with a new level each week. 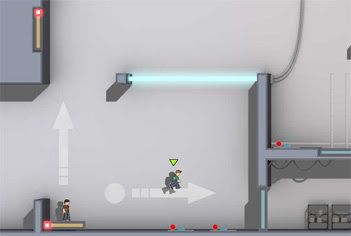 Levels provide a variety of familiar platforming staples such as moving platforms, insta-death spikes, water and switches. The need to swap back and forth between the two protagonists is also heavily incorporated into the gameplay. Arrow keys or A/D move, Z jumps. Switching between characters is achieved via the spacebar.